This 'Colors' deepener script download is ideal for most clients as it draws upon their imagination. Unless we are blind from birth we have all been subject to colors at some stage in our life. 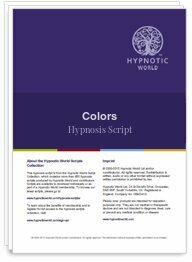 In hypnosis colors take on a different vibrancy. If you have ever studied Ophthalmology then you will know that the photo-receptor cells in the eyes contain about 7 million cones which are sensitive to color. Of course we won't all have the same variation of cones which means that many people are far more receptive to imagining colors than others are. This Colors Deepener has proved so successful that many clients who have heard it before will request the same deepener or visualization again.